Thomas Reidar AAsum Jr. passed away on February 7, 2019, at the Mennonite Village Care Center where he had lived for the past eight years. Tom was born in Saint Paul, Minnesota, November 4, 1928, to Thomas Leif AAsum and Vivian AAsum (Ostrander). In 1935 the family moved to Fairmont, Minnesota where Tom was homecoming King and graduated from Fairmount High School in 1948. Following the graduation of Tom and Jim in 1948 the family loaded their belongings into a WWII army surplus truck and moved west to Corvallis, Oregon. During his senior year in high school, Tom’s best friend introduced him to a freshman cheerleader who was working as a carhop at the Owl’s Nest Drive-In in Mankato. After exchanging letters for four years, Tom’s high school sweetheart, Bonnie Buhr visited Tom in Corvallis in 1951 for Christmas. Following a New Year’s Eve proposal, the couple was married a week later in Oakland, California where Tom was a medic at the Naval Hospital. After leaving the Navy in 1952 Tom and Bonnie moved back to Oregon where Tom worked to complete his apprenticeship in Eugene. 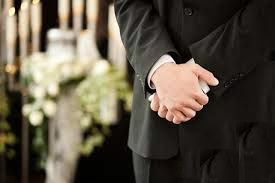 The couple moved back to California in 1954 where Tom attended the San Francisco College of Mortuary Science, in downtown San Francisco and lived with Bonnie in South San Francisco. To help make ends meet, Tom would pick-up donuts and coffee on the way into the city and sell them to his classmates at the college. After graduation, Tom and Bonnie moved to Corvallis where Tom worked at McHenry’s Funeral Home. 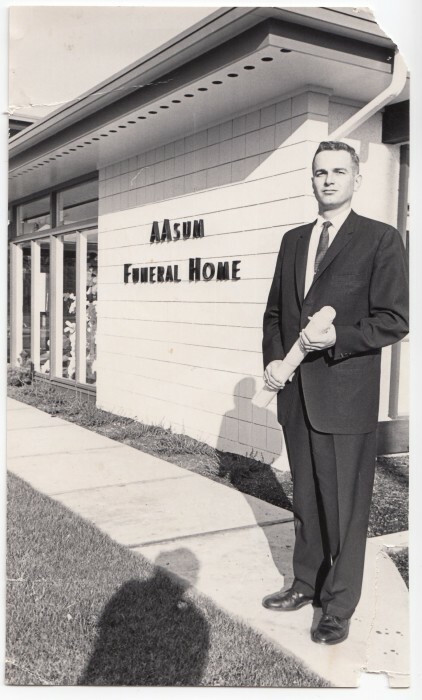 In 1962 Tom partnered with his brother and father to build the AAsum Autumn Chapel Funeral Home in Albany, Oregon. Located on the former site of the Saint Mary’s Catholic Hospital the new modern building was a state of the art funeral facility. After the building was completed Tom moved his family into a beautiful apartment above the new funeral home and Tom quickly became integrated into his community. He was voted Albany’s First Junior Citizen in 1964 and became president of both the Albany Chamber of Commerce and the civic ambassador group, the Albany Woodpeckers. Tom was involved in many civic activities over the years including serving a four-year term on the Albany School Board that oversaw the construction of three new elementary schools. Tom was president of the Oregon Funeral Directors Association in 1977 and was involved in the leadership of that organization for many years. Tom retired and sold the funeral home in 2005. Tom was also deeply involved in his churches, Faith Lutheran in Corvallis and Immanuel Lutheran in Albany, Oregon. To say Tom was outgoing is not quite right - Tom literally knew almost everyone in town and with big-hearted generosity he spent countless hours helping people. He deeply cared about his community and was skilled at counseling those in crisis, whether they were mourning the loss of a loved one or the loss of a job. The stories of Tom bringing donuts and goodies to the mechanics and office helpers around Albany were legendary. He loved exploring the northwest with the family camper, motorhome, boat and later, his Harley Davidson motorcycle. One favorite outing was a yearly trip to Lake Shasta with the motorhome and boat where family and friends spent a week on a houseboat lounging and water skiing. 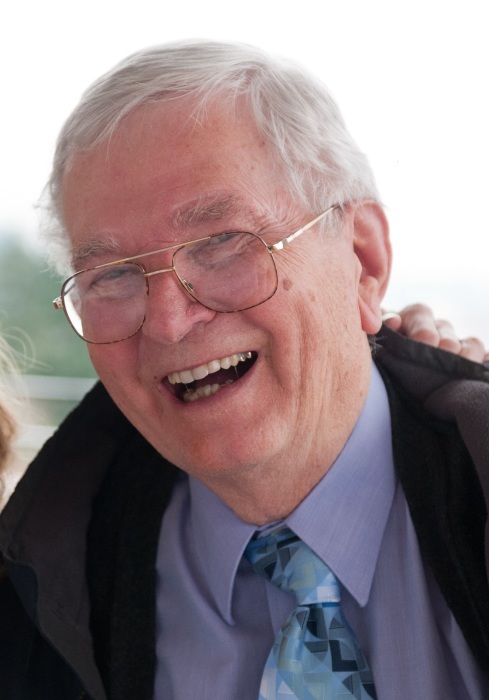 Tom cherished being a father and grandfather and loved his extended family and their numerous gatherings. Tom and Bonnie opened their North Albany home to everyone, and you could always find the neighborhood kids playing in the backyard. After Tom moved to the Mennonite Village, he quickly became a favorite of his caregivers teasing, joking and getting to know all their children by name. Tom’s unquenchable love of life and genuine interest in all those in his life will be missed. Survivors include wife, Adeline “Bonnie” AAsum (Buhr) of Albany; sons, Jamin Laif AAsum of Portland and Jeffery Karl AAsum of Helena, Montana; brother, James AAsum of Eugene; sisters, Nancy V. Packer of Corvallis and Anita (Hilary) Jean Wylie of Springfield; grandsons, Aaron Ring of Bend, Jeremy AAsum of Eugene and Thomas AAsum-Shetler and Sam AAsum-Shetler of Scotts Mill. Visitation will be from 5-6 p.m. Friday and noon to 1 p.m. Saturday at the funeral home. Funeral service will be at 1 p.m. Saturday, Feb. 16, 2019, at AAsum-Dufour Funeral Home followed by a graveside service at Oaklawn Memorial Park in Corvallis. In lieu of flowers, please make a donation to The Corvallis-Albany Farmers Market (checks to "CAFM"), P.O. Box 2602, Corvallis, OR 97339. Please note on check the donation is "In memory of Tom AAsum for Albany's Power of Produce Program." This is the program that teaches kids about different produce throughout the summer. The contact is: Rebecca Landis, landisr@peak.org, (541) 740-1542.